A few months ago my mother called me with news that my grandfather had fallen ill. Unsure how long she was to be staying in the lower peninsula my mother packed her Toyota Rav with half of her closet and the contents of her bathroom and then was on her way, driving 550 miles south to rush to her father's side as he lay in the hospital. 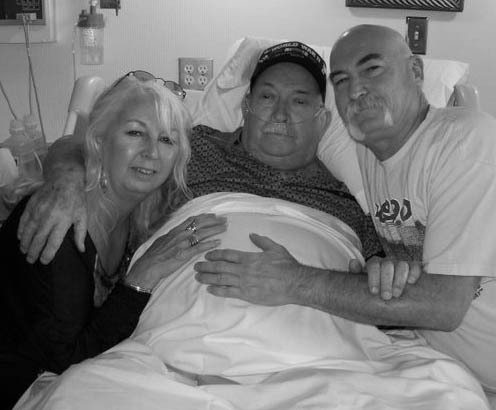 He was diagnosed with pulmonary fibrosis and congestive heart failure, but despite this bleak diagnosis no one had any firm details on the immediate severity of his condition, if there was hope of meaningful short-term or long-term recovery, or how long he'd have to remain in the hospital. As the weeks passed my mother remained diligent. She helped my grandfather prepare for the worst, getting the details of his estate and finances and Medicare in order, meanwhile still hoping for the best. She stayed at his side, talking to nurses and doctors and offering her love and support. She ran errands, cleaned his house, met with relatives, made phone calls, paid his bills, and tended to his every desire. She shouldered the majority of this responsibility as she was the only one in the family that is retired or not raising a family. The rest of the family - her brother, sister-in-law, aunt and uncle, nieces and nephews, helped out when they could and visited often, and yet after nearly five weeks of constant care and upheaval, my mother began suffering from fatigue and exhaustion and a heavy spirit. My grandfather was eventually moved into a pulmonary rehabilitation center to work on achieving and maintaining an increased level of physical independence and functioning. His stay was to last a month but he barely made it three weeks before having another episode that resulted in being rushed to the hospital again. This time the outlook was worse than before and his condition continued to decline. I called my mother a few times a week to check in on her. I was sorry that she was having to deal with the her father's illness and being away from home for so long but she said she wouldn't want it any other way, that by his side is where she belonged. With every phone call I tried to take her mind off of things, tried to make her laugh and lighten her spirit, but with every phone call she sounded lower than before. Defeated. And I was worried. One night while sitting down to the computer after dinner I received an email from my cousin, Robert. It read, "Grandpa is not doing good at all. I just left the hospital and he really, really wishes he could talk to you. Please call him, I do not think he has much time and he does not understand why you two do not talk. Please call him." I was speechless. This was the first time in 15 years that I had ever heard that my grandfather had asked after me. Mind you, I didn't hold any grudges against the man, I was a child when I decided those things for our relationship, but I thought surely he must hold one against me for starting this 15 yearlong silent treatment, I truly thought that bridge had burned. When Robert sent me that email it was 11:00pm in Michigan. I called my mother to get my grandfather's phone number, I would call him in the morning. When my mother answered the phone and I told her about Robert's email, the dam burst. She broke my heart with her tears and cries as out poured her own heartbreak about the reality of losing her father. "He's my hero, my champion, the bravest man I know and I love him so much, so much." And there it was. The business of living and dying, loving and losing, and I didn't want her to go through it alone. When I hung up the phone I paced the floor worrying the seed of an idea in my mind. Should I go to Michigan? We can't afford the travel expense. This is important, I'm needed there. Am I needed there? I should go. What should I do? I talked it over with Adam, my father, and my best friend, Natalya. They all offered sound advice and support but ultimately it was my decision to make and I was waiting to feel my compass turn Northeast. After a fitful sleep racked with nightmares of sickness and death I woke up and purchased my tickets to Michigan. I called my grandfather that morning and the sound of his voice was like a warm breeze from the past and it filled me with a longing that I did not anticipate. Our conversation was friendly but his hearing was so bad that I don't think he understood half of what I was saying. I was unfulfilled by our poor communication and it offered me no solace or insight on the state of where we stood. But everyone seemed excited about the news that I was coming home. I'm glad I finally got back here to read this. We make our relationships so complicated sometimes, don't we?